Antonio welcome on the Forum. It is nice to have some more feedback from MOXY users so we can discuss and help each other on developing a very interesting tool for coaches and athletes alike outside the " secret " world of sport science. We all cook just with water and once we start looking at practical applications we see often our limits but as well new and exiting opportunities. I use NIRS ( in specific Portamon ) since years for live feedback during very specific workouts on clients. They are super motivated, when they can see number in front to push themselves to certain loads and to have their individual recovery time as they look recovery. It will be super interesting to see your protocol and learn from it and may even be able to give some additional feedback. From the practical side an interesting challenge we have is mounting the devices on the muscles. In a set up like a rehabilitation center I use stretch tape but for real live we have to see, what we can develop for some easy attachment on any interesting muscle. I very often combine SEMG with NIRS to see, which one would be easier for the client but I see more and more the situation, where NIRS seems to be easier to use as a feedback , but for the moment SEMG is easier to attach on the different muscles due to its multi channel options. So I look forward and will be very exited to learn and read from your experience. I am very happy to contribute to the development of training protocols with Moxy device. 1) functional assessment for my athletes through integration between HRV (heart rate variability analysis), sEMG and Moxy. later I will begin to post the first data. Here an initial " warm up " to the protocol we will see from Antonio on strength as well how HRV may be involved and affected by strength as well. This will be super interesting , as respiration and certainly the non respiratory function of the diaphragm has a direct influence on HRV. The second interesting part when using NIRS in strength workouts is the difference between scientific induced occlusion interventions and naturally occurring blood volume changes due to muscular contractions. I like to show you some classical occlusion reactions in picture 1 and picture 2 and than a naturally occurring compression due to isometric strength production in a heavy load workout. You see the third picture as a super close look on tHb and O2Hb and HHb trends including Hb Diff during a strength workout from the vastus medialis. Pic one is a set of occlusion as an interval section. Art occlusion. Pic 2 is a set of three occlusion test done from three different groups with one a perfect art. occlusion ( Thanks Andri ) and 2 incomplete not perfect designed occlusion test. Pic 3 is a closer look at a full muscle contraction as it occurs during a strength workout and if you look carefully you can see the different phases, as well the fundamental difference between a artificial set up occlusion in a study versus a naturally occurring compression in a workout. Use a compound movement like Back Squat, Barbell Row, Bench Press, Romanian Deadlift, Military Press and do 10 bottom partials using constant tension, 10 full reps accelerating as much as you can, then 10 top partials using constant tension. The goal here is to create an hypoxic state in muscles with constant tension and light load for maximixe lactate accumulation and increase in production of both hGH an IGF-1 (Takareda et al. 2000). Use an auxiliary/isolation movement like dumbell press, biceps curls, triceps extensions, cable pulley etc. and focus on constant tension working muscles hard during every inch of every rep and never allow muscles to relax. Your goal is to create an hypoxic state, so control with moxy device the SMO2 levels of target muscles (in relaxed state SMO2 levels could be between 70-87%). Great info . Here a question we just discussed in a very international group in Santa Monica. 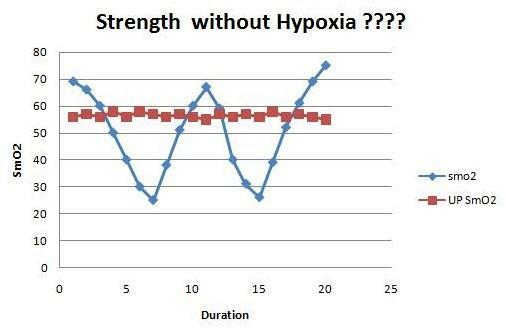 How do you decide by using moxy , whether you are in your target hypoxic stage ? Here a visual to Antonio's information. What is hypoxic and what is ischemic, when reading many studies about hypertrophy and strength workouts. This is a visual from the University of Georgia. Today we used the Moxy as the director of training and ultimately the program was designed after the training. We warmed up until maximum SmO2 i.e. 80% then we lifted weight to drop the SmO2 (40%) till a plateau (plus a few more seconds) then recovered till Sm)2 reach 80% (sometimes overshoot) then repeated till a) could not reach 40% or b) could not recover to 80%. Will repeat for 4 weeks and retest to see change in strength, power, force, and SmO2 i.e. increase above 80% and/or decrease below 40%. The idea is based on physiology, which will show results then we can design a progam. It is quite here, despite the fact , that MOXY will be the choice of tool for future strength training sessions. So here a question to the groups out there and to Antonio in specific terms.
" The goal here is to create an hypoxic state in muscles with constant tension and light load for maximize lactate accumulation and increase in production of both hGH an IGF-1 (Takareda et al. 2000). in a " hypoxic state in muscles "
Can you show us some printout and how they look , location on the muscle , type of workout and MOXY graph printout. Thanks and we look forward to a great information and hope fully a fruitful discussion. Brian form NEXT Level Sport is possibly one of the rare coaches steady trying to find a way to improve outcomes. He runs a great Canada wide organization now and integrates very successful new ideas into traditional information. They do testing with literally hundreds of athletes and his information and data collection in the field of NIRS and MOXY is most likely the best worldwide , when it comes to practical applications. He is a part of our ongoing drive to create real assessment options. Testing in the specific sport filed rather than lab bike assessment with athletes, who very rarely will be pushing a bike. 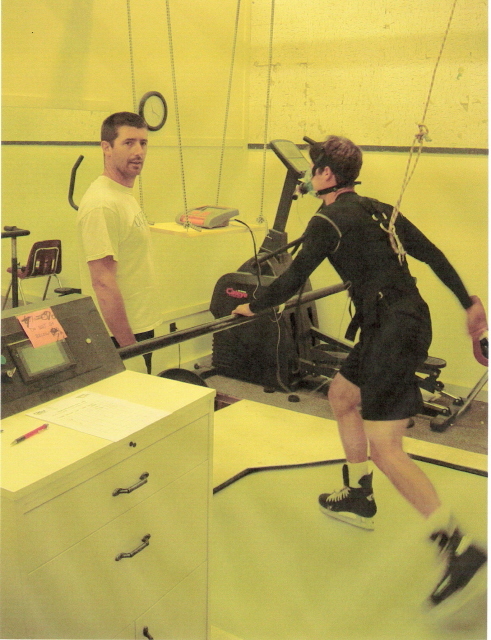 Brina helps me to develop ideas like IPAHD and IPAHR for ice hockey as well as integration of different tools and equipment in the practical application of testing See pic Brina assessing an athlete on a skate mill in our small town. A group training with the goal to change O2 Diss curve by attracting desaturation situation. A one by one session with a NHL player Okay enough flowers here. I like to add some interesting trends we see and where we for the moment move our attention to. Three different way we can use and control physiologically the load during strength workouts. The question now of . the next few years will be to see how each of this loads will change the result of the workout. In the past we used weights and reps randomly and where hoping it works. In the future we will use deoxygenation SmO2 and reoxygenation as a the information of load and recovery rather than 5 fingers and 20 pounds. For people ready to change but going somewhat slower, they can still use weight but control load and recovery over SmO2 rather than time or finger counts.. Here a print from each of the different options and there are many more to be used, like complete recovery , semi complete recovery and super compensation recovery. This prints later. So here now basic idea to show how we asses. It is super easy and for coaches using functional workouts ( body weight a great new way to objectively assess load and recovery based n each athletes individual physiology. Sorry skate mill pics was missing. Brina will be as well the first in Canada, Clint the first in the USA , who will run Spiro Tiger competency centers with the new Mirror software, which allows them to coach over the computer respiratory interventions. The key , when adding Respiration to workouts is to keep in mind hyper and hypocapnia levels. So SpO2 and EtCO2 testing combined with SmO2 testing . What we hope to achieve is that once an athlete is set up with the proper information he just needs the SmO2 and can check on his wrist the oxygenation and deoxygenation trends as he works out as planned and set up for himself or with a coach. People interested in any of this ideas can contact MOXY as one plan in the near future is to add to the Spiro Tiger competency Centers as well MOXY competency centers. So readers running already a successful test or assessment center can easy add this additional information and data collection to their current test ideas and enhance and advance in the competitive field of sport centers. Here the pics from Brian as well a set of Spiro Tiger workouts for Core strength combined with Hypoxic hypercapnic parts form a national coach in Switzerland. I'm fascinated by the 3 strength training graphs that you showed here. I'm looking to include these in a Power Point that I'm putting together. On which muscles are the two Moxy sensors located and what type of exercise is being done? 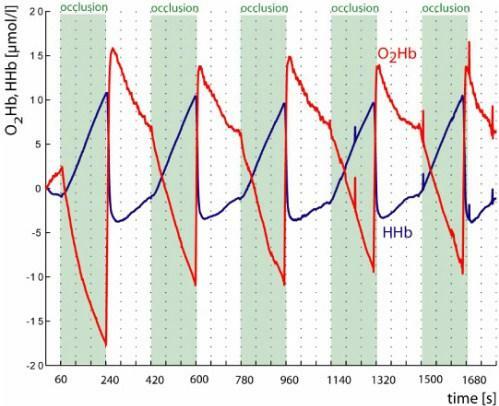 In the third graph, what is going on physiologically when both the exercising muscle and the upper body maintain a plateau for about 4 minutes (Between the red lines) and then abruptly the upper body SmO2 starts to drop? Is this a specific fatigue response? Why is the transition so abrupt after 4 minutes of being steady? 1. This are case study and we need to do much more before we can give a clear answer. This is why we will look for many centers who have MOXY's to be a part of a new development in new ideas of individual strength workouts. To the graphs. Duration on the bottom is misleading as it is a time unit but not as in minutes or in seconds. As we have time on the moxy printout and we have a different set up in the Portamon I simply neutralized to time to synchronize the values. Moxy on the vastus lateralis or Portamon on the vastus lateralis. or Vica versa. Optimal may be later 2 MOXY's on each of the positions. The upper NIRS was on a biceps muscle. The exercise: Simple squatting exercise.. We run for the moment the whole idea with 2 MOXY's and a big number of Kids with Brina and Next level SP ice hockey coaching. Pic 1. The normal drop in tHb and SmO2 as an initial ( venous washout ) due to muscular compression . This is important to understand, when we look later at reactions in SmO2 tHb and I will show you the "inside live" of an isometric contraction in the next few days and how we can make some trend information in rehabilitation of muscles when comparing to the good side. So in Pic one we basically made a strength load as kept going till SmO2 would reach a possible actual low level. Than we started recovery. The question here. Is this considered hypoxic or actually still very " aerobic" as we see a drop in SmO2 meaning a still existing ability to use O2. In Pic 2 we push as in exercise one , than reach the bottom of SmO2 and keep that level as long we see we can maintain a decent plateau.. Meaning possibly , that we hit the bottom of O2 use and now have to try to maintain the contraction by other means than O2 so O2 independent and using oxygen independent energy sources to maintain the ATP production needed for the workload. Question is this now Hypoxic work due to the plateau of SmO2. We are not sure as we can create some different situation and in this case we need again tHb to make the next conclusion out of this. 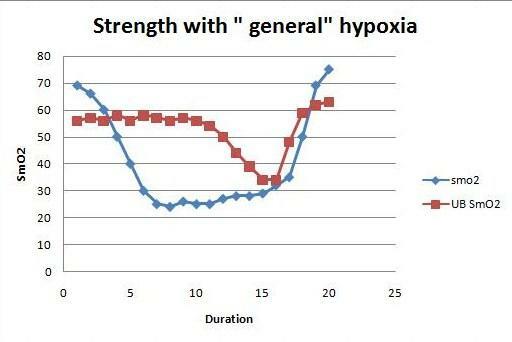 Possibly the case 2 is close to a hypoxic stimulus. Case three. We repeat all the above drop ( washout ) use of available SmO2 , plateau of SmO2 and possibly integration of O2 independent ATP production and now we keep pushing through this barrier of discomfort and than we had a drop in SmO2 in a not involved muscle area.
? Why : Question . There are some ideas out there, that the body will try to find O2 where ever it is possible. Some cases explain as well this same ability of the body to find glucose in not involved muscles. ( lactate during a ironman in the marathon section) So our question here is , whether we have a survival control by using O2 from other areas of the body to be moved in desperation to the extreme working muscle groups. If this is the case, do we than work suddenly again with O2 after the hypoxici workload. Some may remember Dudley's work n STF and FTF fiber activation. where they had the open question , why in absolute extreme intensity the STF fibers would kick in again. , despite the common believe , that only STF x and II fibers suppose to be able to create the ATP needed for this extreme effort. So the question here is, is this above observe reaction a possible explanation to Dudley's open question. Now what is interesting . If we have athletes doing push ups so they can do 30 - 50 push ups no problem. When we push them into picture 3 situation with their legs they can barely do a few push ups after the deoxy situation in their upper body. Summary. 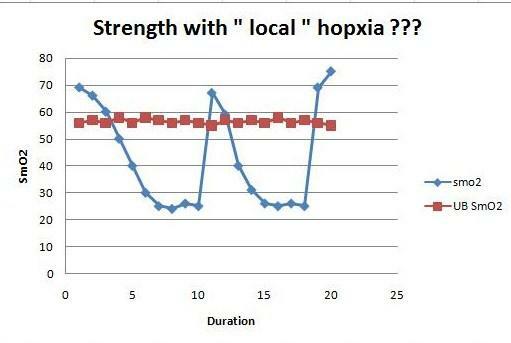 This above ideas have to be followed now trough and Brina started a longer term study to see, how the strength gain and reaction's are, when we do sets like in Pic case 3 which may give 1 - 3 sets rather than 5 - 10 and whether we have a similar more or less gain in performance and how can this gain be shown in actual sport activity. I started to do some deoxy workout by combining the above ideas but add a hypercapnic hyperpnoea section in it so we have a extremely fast and deep deoxygenation with SpO2 90 % and EtCO2 about 50 mmHg. The interesting part is that we can do one set only and the h muscle is really " fatigued" respectively no performance really anymore available. Remember . we have cases but we need caseloads. so we need to be able to repeat this in the next 20 - 50 athletes we test to understand at least the trend and than come the next step to understand the actual reasoning behind this observation. Here just a visual information, hwo we test for the moment different interval options. This are three different ideas. 2. Insufficient rest and three super compensation rest.
. The interesting part here now is to see, what changes may occur when using one or the other of this physiological guided interval options. In the past when did 5 finger , 400 m( one loop&nbsp runs and 1 min recovery we had this set up out of more organizational reason without any real physiological reasoning . It was easy , no finger left workout was over. 1 loop gone distance was covered. I loop on the watch and time was ready to go again. Great to organize and easy to write down but very little physiological information whether this would make sense. Now the physiological ideas make physiological sense. What is missing is the understanding on the different physiological reactions. Advantage now. If we get a change we know exactly why. If we do not get a change we again know why. In the past if we got a change great ( no clue why in this athlete it was working but we where happy. If with the same interval workout another athlete made no progress we still had no clue why as we had no information how the physiological system where stimulated we only had physical information on what he did. So result" we where unhappy and had no clue why. Most common explanation . Well you may have reached your genetic potential. Pretty much the same answer we give, when somebody does not improve VO2 max. VO2 max = CO x ( a-v) O2 difference. Question. How many time when you do a VO2 max test anywhere did they tell you how much the CO was and how good the (a-v) O2 difference reacted. ? So if your answer is never, than the question would be, How do we know, why VO2 max does not increase anymore, when we never actually assess the factors, which influence VO2 max. 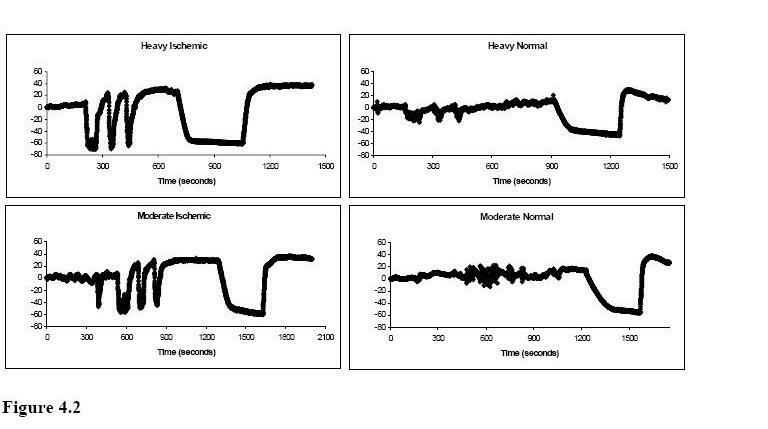 Cardiac system and musceloxygenation trends.? It is long time since we had the MOXY info with HRV and SEMG protocol from Antonio. We did in the mean time since his first post exactly what he suggests we used SEMG as well information from Lactate" to see, what the 50 - 60 % of load really is doing , when we aim for a hypoxic reaction including some lactate reaction . 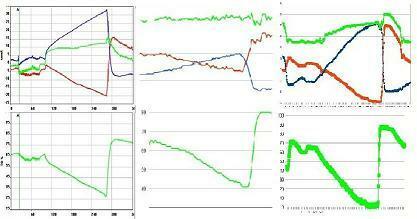 We hope to see Antonio's data's soon so we can compare and see,w here we have similar or very different outcomes. Fro HRV we used 2 equipment. Polar as well as BIO harness from Zephyr. Fro NIRS we used MOXY and Portamon. For lactate we used the lactate Pro. So I am looking forward to the promised data's from Antonio's nice protocol we go on here a while back.